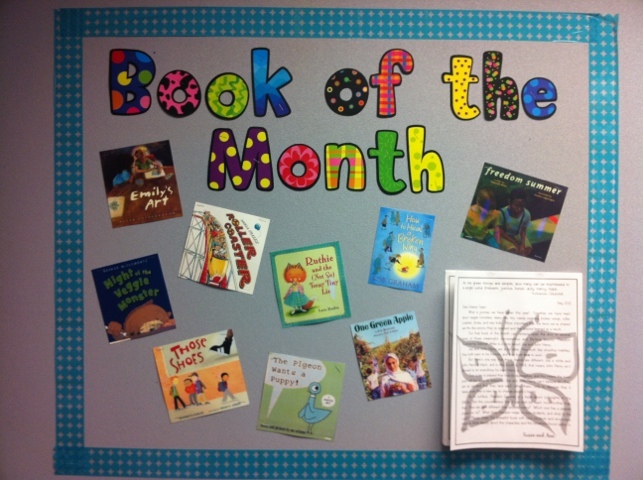 One of my favorite projects at school this year was definitely our Book of the Month program. We got this idea from PS 277 in New York City. My principal and I had the opportunity to spend a week at that very special school back in February of 2011 while attending the TCRWP Institute on Literacy Coaching and Whole-School Reform. I fell in love with the idea right away, and my principal did too. The opportunities this provided for common conversation around texts was amazing. I could go into any classroom in the building and know some texts that I could use to activate their schema. It created a common (mental) “books I’ve read” log for every single student in the building. One of my favorite testimonies for the program was a conversation I witnessed during a writing celebration. A class of second graders came into a Kindergarten class to share their latest pieces of published writing. They were sprawled all over the room in groups of two or three, and the Kindergarteners listened attentively as their 2nd grade buddies read their pieces aloud. I leaned into one partnership (two boys) just as the 2nd grader finished reading. The Kindergartener clapped (so cute!) but obviously didn’t know what to say, so I prompted him to talk about his favorite page. (I knew this was in his comfort zone, as this is a prompt card strategy they use to talk about books in literacy stations). The 2nd grader handed his booklet over, and the Kindergartener immediately flipped to a page near the end. “I love this page the most,” he said. “It has a lot of words, and the picture looks just like a picture in a book that we read about a roller coaster.” I notice that he’s pointing to Roller Coaster by Marla Frazee (a previous book of the month), so I grab it from the chalkboard rail where it is displayed and hand it to him. The 2nd grader’s eyes lit up as he explained how Roller Coaster had been his mentor text for that piece. “This book is a small moment, and we were writing small moments, so I used it to help me!” he shared. The boys went on to discuss the book further, and that 2nd grader seized the opportunity to teach his Kindergarten buddy about using mentor authors. What a powerful confirmation for him! While I don’t know how long we’ll be able to continue the Book of the Month program, I’m thrilled with the idea that when August rolls around, every teacher will have a stack of picture books that almost every single student in his or her class has already read. I hope that this will allow for deeper literary thinking to begin on day one of instruction! I know that funding is definitely a roadblock to a program like this, but even if you start with one book that goes into every single classroom, I think you’ll be amazed at the connections kids can make. If you do decide to try it (or you already have), I’d love to hear which books you’re using!